Take the Plunge with Oahu Swim with Dolphins Tour & Ticket Today! Take the time and immerse yourself in the adventure of a lifetime with Oahu swim with dolphins tours and tickets in crystal clear waters. You need to stop taking mediocre vacations that you will never remember and create a vacation that will make waves of emotions within you. With the Oahu dolphin programs, you will plunge into the remarkable world of these powerful marine mammals and come face to face with bottlenose dolphins and other majestic cetaceans. You don’t need to ask yourself anymore the question “where to swim with the dolphins in Oahu Hawaii?” because you have come to right website.. This Oahu’s dolphin facility offers numerous unforgettable magical moments. Located only 20 to 30 minutes from the Waikiki hotel zone, the park features beautifully-designed lagoons, reefs, and pools. 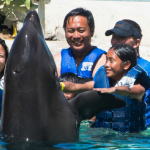 The dolphin programs offered are suitable for both adults and children alike from the top of the line Royal Dolphin Swim to the shallow water, non-swim, Dolphin Encounter. Remember, the dolphin program in Oahu is very popular. If you are planning your vacation in advance or have arrived on the Island now, you need to make your reservation as quickly as possible because the spaces sell out fast. Get Full Featured and Discripted Email.